Follicular cell suspension is a recently described technique of cellular suspension for treatment of stable vitiligo. Its uniqueness lies in the fact that hair-follicle melanocytes from the outer root sheath are utilized as a source of melanocytes unlike traditional methods, which use epidermal melanocytes. Few distinctive properties of these hair-follicle melanocytes make them an attractive source of donor cells over epidermal melanocytes. In this article, we briefly discuss the theoretical basis, procedure and advantages of this novel technique. Vitiligo is an acquired depigmentation disorder with great impact on patient's appearance and quality of life. 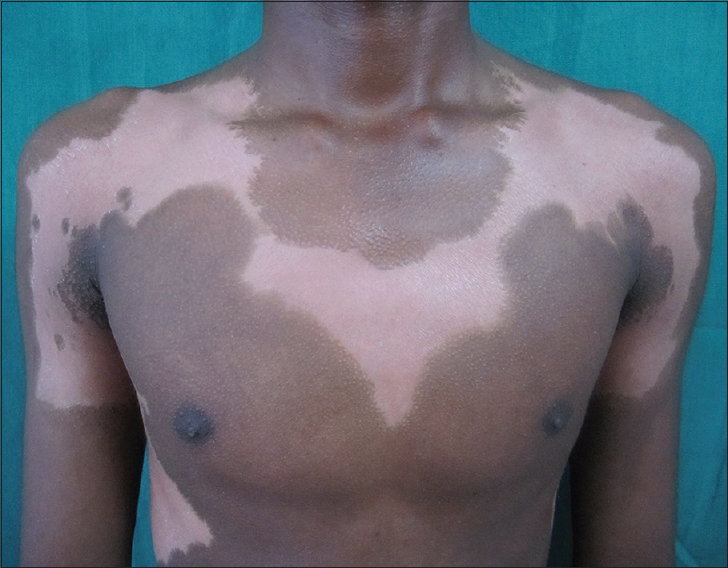 Till date, the etiology of vitiligo remains elusive, which makes it difficult to have curative therapies. Photochemotherapy (psoralen and ultraviolet A) long remained the mainstay of treatment of vitiligo, until the advent of narrowband ultraviolet B (NBUVB) phototherapy, which revolutionized the treatment of vitiligo with better results, tolerability and side effect profile than the former. It has been used favorably, both alone as well as in combination with other agents like topical calcineurin inhibitors, Vitamin-D analogs, oral and topical corticosteroids, antioxidants, etc. Recently, various new phototherapeutic modalities like excimer light and laser have come into use with encouraging results. In this article, we review the journey of NBUVB so far and highlight the current status of other new phototherapy modalities in the treatment of vitiligo. Melasma is a notoriously recidivist condition with yet unclear etiopathogenesis. It seems to have a multifactorial origin with both genetics and environment playing an important role. A genetic predisposition is suggested by a high reported incidence in family members in certain racial groups. Among the environmental factors, exposure to ultraviolet and visible light constitutes the biggest risk factor. Onset or worsening of melasma during pregnancy and during or following intake of hormonal oral contraceptive pills suggest the involvement of hormonal factors. 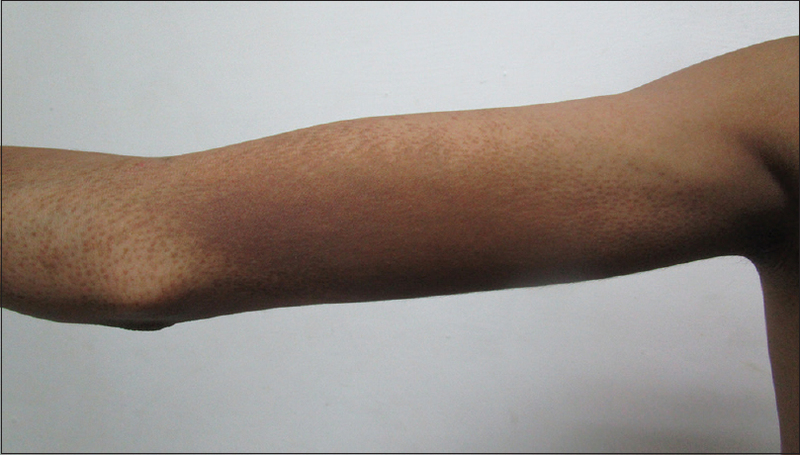 The role of cutaneous vasculature in its pathogenesis is suggested by presence of clinically appreciable telangiectatic erythema confined to the melasma lesional skin in many patients, a finding reinforced by dermatoscopic evaluation and detection of upregulated expression of vascular endothelial growth factor, in the lesional skin. Various other factors such as thyroid disorder, drugs, cosmetics, stress may exacerbate existing melasma in a subset of patients. Although the precise molecular pathogenesis of melasma remains mysterious, up regulation of inducible nitric oxide synthase and many melanogenesis-related genes and melanocyte markers such as TYR, MITF, SILV, and TYRP1, Wnt pathway modulator genes, genes of prostaglandin metabolic processes, and those regulating lipid metabolism seem to be operative. In summary, though the exact etiopathogenesis of melasma remain appalling, newer studies have provided corporeal evidence in favor of certain previously suspected and some novel factors. Further research in this area will not only provide more evidence for their involvement in the pathophysiology of melasma, but also offer attractive targets for development of newer treatment modalities. This article exhaustively reviews the validity of the previously postulated etiological factors based on hitherto-accrued evidence, and explores the newer suggested pathogenetic mechanisms, which may pave way for development of novel therapeutic strategies. Background: Vitiligo is a chronic pigmentary disorder affecting about 0.5-1% of the population. Although the disease is not life-threatening, it considerably influences the patient's quality-of-life (QoL) and psychological well-being. Aims: The aim was to assess the impact of clinical and sociodemographic variables that affect the generic and dermatological health-related QoL in vitiligo patients. Methods: The prospective cross-sectional study was conducted from February 2012 to February 2013 in the dermatology outpatient department of Bangalore Medical College and Research Institute. A total of 300 vitiligo patients and 300 healthy controls, who were matched on sociodemographic data, completed two questionnaires (general health questionnaire 28 items [GHQ-28] and Dermatologic Life Quality Index). Patients with higher scores in GHQ were further assessed for psychiatric illness by using mini international neuropsychiatric interview 5 questionnaire. SPSS statistical package was used for the analysis of the data. Results: The prevalence of psychiatric morbidity was 21.7% (65 patients). Female patients with vitiligo, patches on exposed parts of the body, longer duration of disease and past treatment history had an adverse impact on QoL. Conclusion: Our study concludes that QoL impairment and psychiatric morbidity is high in vitiligo patients. Hence, along with the medical intervention, it is important to assess the psychological and sociocultural aspects of the disease for better management of these patients. Background: Facial melanosis is a group of heterogenous entities, sharing a common clinical feature of altered pigmentation of the face and thus easily visible cosmetic disfigurement and significant psychosocial consequences. The importance of these disorders is growing, as they form the major percentage of dermatology consultations. Aims: To assess the patients of facial pigmentary disorders for demographic, etiological and clinical profile. Methods: This prospective hospital-based clinical study, conducted in a tertiary center over 1-year, involved 208 patients with facial pigmentary disorders, assessed using detailed history taking and clinical examination for demographic, etiological and clinical data. Relevant investigations including the skin biopsy and patch testing were also done wherever required. Results: The maximum number of patients belonged to 21-40 years age group (56.73%). Females predominated the study, with a female to male ratio of 1.92: 1. 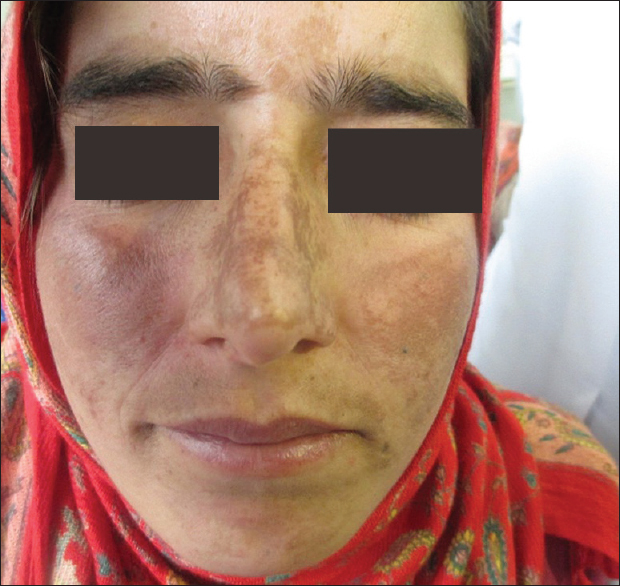 Among patients of facial hypermelanosis, melasma was the most common comprising of 73 patients, followed by postinflammatory hyperpigmentation (35), periorbital hyperpigmentation (14), ephelides (10) and lichen planus pigmentosus (9). Riehl's melanosis (8), drug-induced hyperpigmentation (6), naevoid hyperpigmentation (1), acanthosis nigricans (1) and Addison's disease (1) were other hypermelanosis conditions. Pityriasis alba (22) was the most common cause of facial hypomelanosis followed by vitiligo (19), postinflammatory hypopigmentation (8) and leprosy (1). Almost all cases of facial hyperpigmentation gave history of exacerbation following sun exposure. 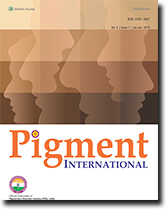 Conclusion: A variety of pigmentary disorders, both hyper and hypopigmentation, with variable clinical presentations and etiological factors, and associated with significant distress affect the face. Progressive cribriform and zosteriform hyperpigmentation is a distinct clinical entity presenting with cribriform macules present in a dermatomal pattern. Much conflict is present in the literature regarding the nomenclature of this disorder. A plethora of pigmentary anomalies have been described in the literature, which demand proper classification. This article provides an insight into the conflict, which surround these entities. Dyschromatosis universalis hereditaria (DUH) is usually an autosomal dominantly inherited disorder characterized by the presence of hypopigmented as well as hyperpigmented macules. We report an Indian patient with DUH having involvement of palms and soles, flexures and ocular mucosa. He also had signs of neuropathy, which on further evaluation turned out to be pure neuritic Hansen's disease. Griscelli syndrome is a very rare autosomal recessive disorder with only about 60 cases reported in the literature. 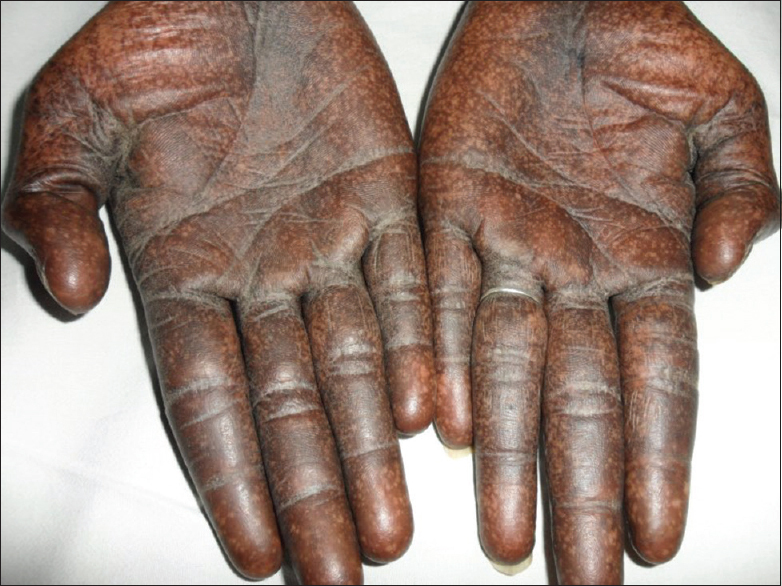 It is characterized by reduced pigmentation of the skin, silvery discoloration of the hair and immunodeficiency. Patients can have an accelerated hemophagocytic phase. The accelerated phase commonly occurs following an infection and has a high risk of mortality. Griscelli syndrome has to be distinguished from Chediak-Higashi syndrome and Elejalde disease, which can also present with silvery hair. 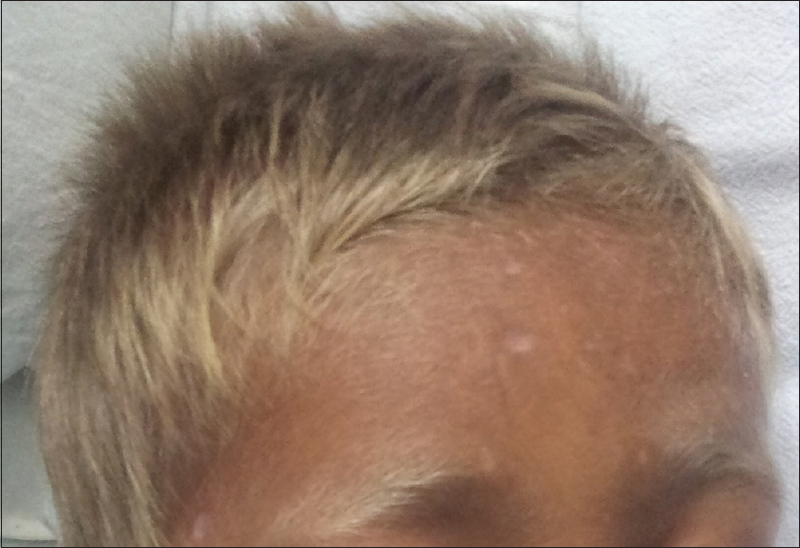 In this case report, we discuss the child with silvery hair who presented with hemophagocytic lymphohistiocytosis following varicella infection and was diagnosed to have Griscelli syndrome. Cutaneous melanomas, tumors of epidermal melanocytes are infrequent but highly lethal skin cancers. Initial stages of acral lentiginous melanoma (ALM) may be difficult to differentiate from the plantar wart, black heel and other benign nevus conditions. Even with available modern treatment options, the mortality is still on the rise, which in part is related to the delay in diagnosis. Here, we present a case of ALM, previously treated with excision and lymphadenectomy who presented with in-transit metastases (ITM). 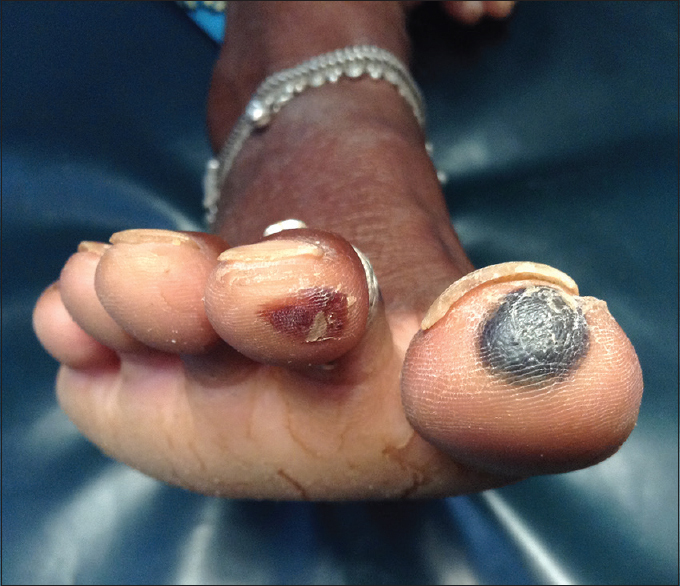 A 45-year-old female patient presented with two black plaques over her toes for the past 3 months that were persistent without any changes in the color, size or surface. Histopathology showed epidermal hyperplasia with corneal collection of fibrinous proteinaceous material and hemosiderin-laden macrophages and fibrinous exudate. 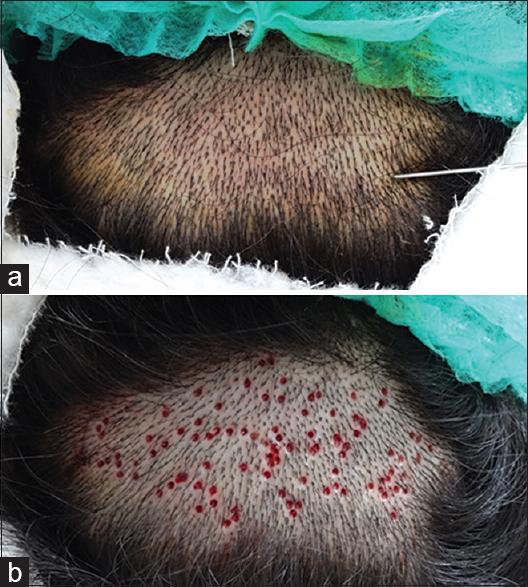 We report this case to highlight the importance of proper diagnosis by means of dermoscopy and paring, of any black patch over acral regions in order to exclude the more concerning acral lentiginous melanoma. 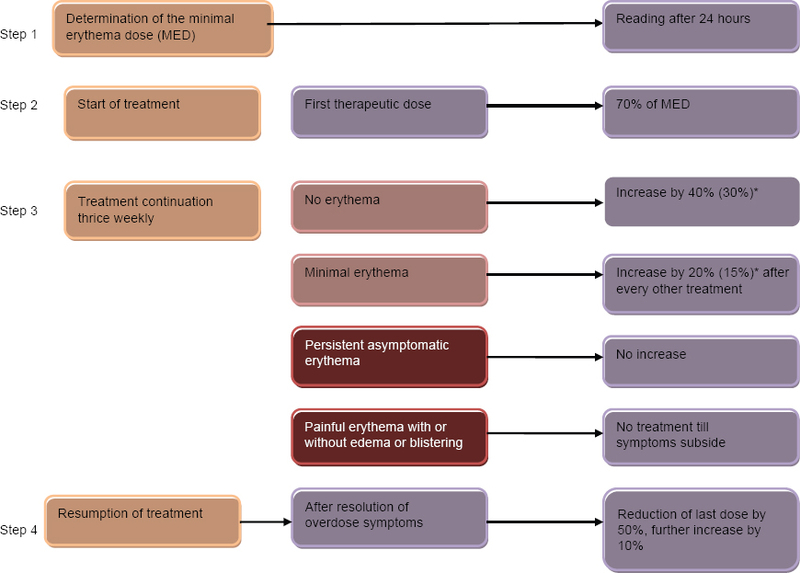 Adverse drug reactions are a common hazard of modern pharmacotherapy; fixed drug eruption (FDE) is a distinctive cutaneous/mucosal drug reaction that characteristically recurs in the same site with each exposure to the offending drug. 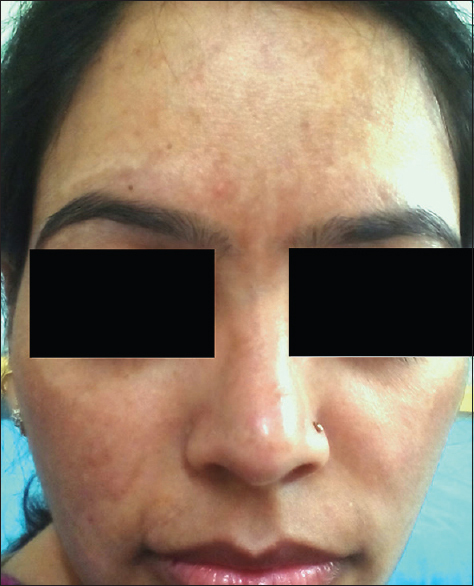 Commonly, FDE presents as an isolated patch or plaque which heals with hyperpigmentation, however, occasionally multiple skin lesions may be present; when it is called generalized or multifocal FDE. Although many drugs are known to cause FDE; newer culprit drugs are still being reported. 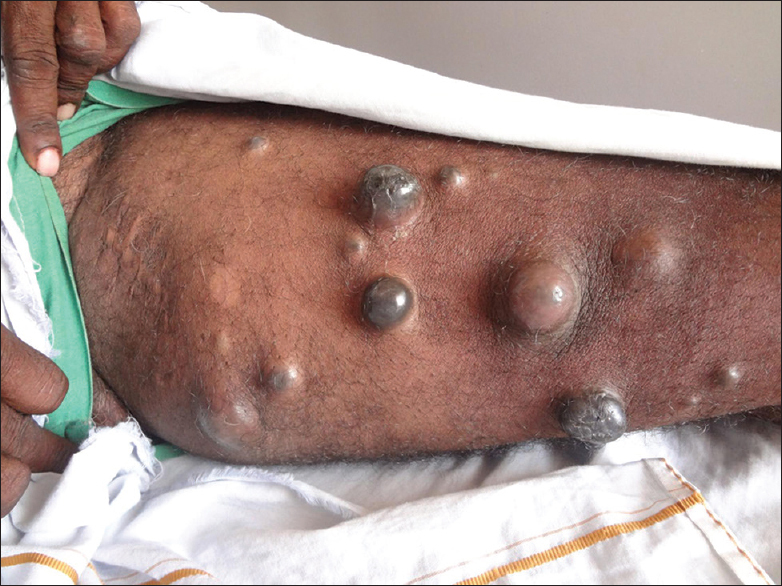 Here, we report the first case of albendazole-induced generalized multifocal FDE from India.